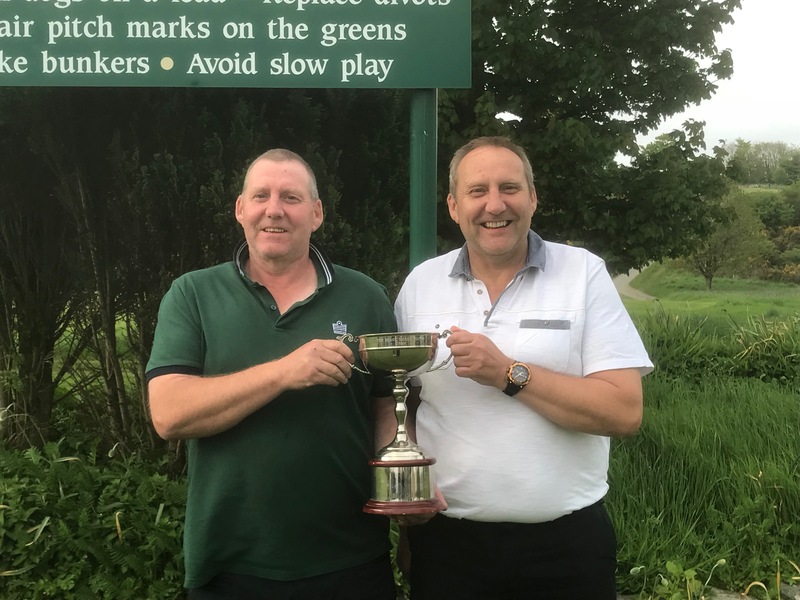 NEWTON Stewart Golf Club held their annual Double Greensomes competition in May, sponsored by the Black Horse Hotel. Winning for the second year in succession were brothers Hamish and Peter Hughes (pictured) with a wonderful score of 77-17.2 = 59.8. In second were Liam Muir and Kevin Warren (81-17.4 = 63.6) and in third Jamie McClymont and Kevin Hughes with a 77-12.8 = 64.2. ANOTHER busy weekend at Newton Stewart Golf Club saw the Margaret Baird Quaich being won by Wigtown and Bladnoch's Angela Potter and Vicky McLean from Dumfries and Galloway. The winning score was an excellent 87-18.8=68.2. New Galloway pair Marena McClymont and Anne McQueen were second (86-16.4=69.6) and Newton Stewart's Vice and Ladies Captain, Lynn Allan and Mary Campbell were third (95-22.2=72.8). 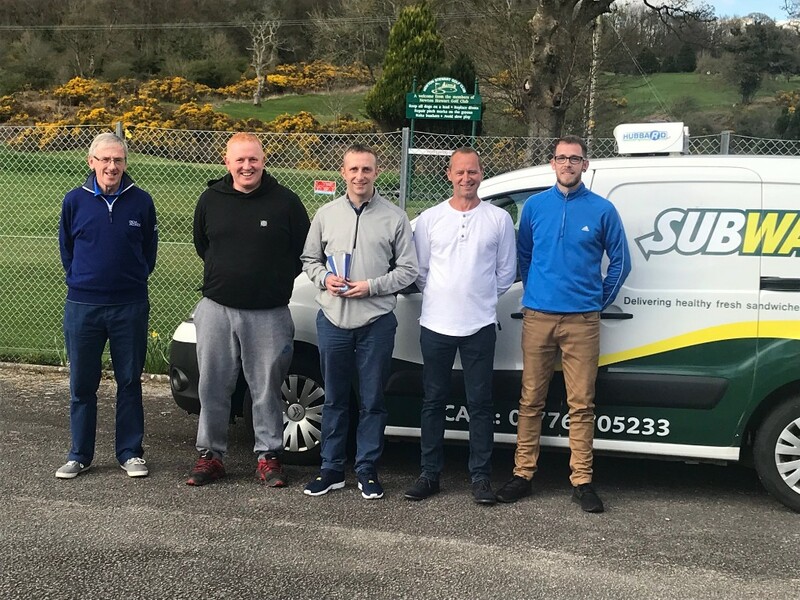 ON Sunday 29th April Newton Stewart’s own Ross McCrindle secured the first singles Open of the season by winning the Subway Stranraer Open with a wonderful score of 74-10=64. Pictured left to right are John Brodie Snr, Division 2 winner (85-17=68), Jamie Telfer, Wigtown and Bladnoch, scratch winner (70), Ross McCrindle, our sponsor Paul Kirk and Club Captain John Brodie Jnr. Not pictured but also in the prizes were Newton Stewart’s Craig McKie, runner up, (71-5=66) and overall third David Irving (75-8=67). A special thanks to Paul and Michelle Kirk for their support of the club. MEMBERS and visitors from across the region supported a fantastic opening Texas Scramble for Newton Stewart Golf Club on Sunday. The victorious Newton Stewart team of Scott Whannel, Connor Bennewith and Alan and Craig McKie carded an amazing score of 57-1.9 = 55.1 to overtake a Wigtownshire County team for the trophy by a narrow only 0.3. The County team consisted of G Smith, D Agnew, J Caldwell and J Caldwell Jnr and scored a 61-5.6 = 55.4. In third place were Newton Stewart quartet, Liam Muir, David Allison, Mickie Bartle and Kevin Warren with a score of 63-6.9 = 56.1. Nearest the pin was Graham Weeks with 145 inches on the par three 12th and the longest drive went to Gavin Millar from Powfoot with a fantastic drive on the 18th. With 34 teams playing, the clubhouse was a busy place for the start of the season. Pictured below are the two prizewinning Newton Stewart teams and Club Captain, John Brodie Jnr. On Sunday, April 1st, the club held its opening Captains vs Vice Captains event where teams representing Club Captain John Brodie Jnr and Ladies Captain Mary Campbell took on Vice Captains Justin Moore and Lynn Allan. It was Mary and John's team who came out on top, winning 8-2. 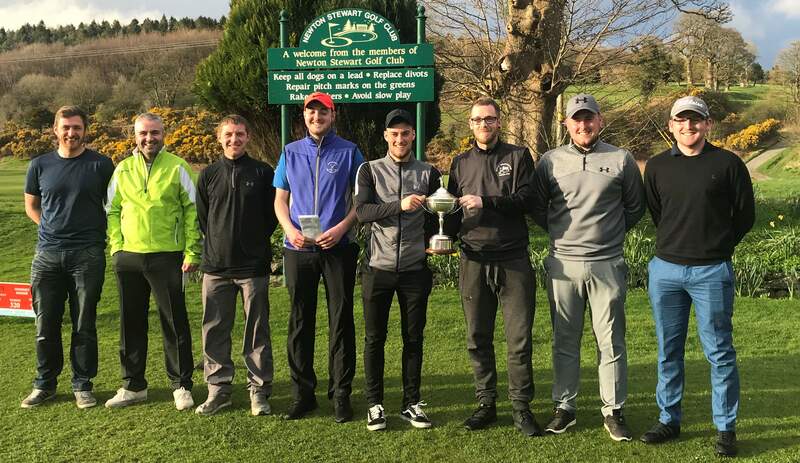 Newton Stewart Golf Club held their first competition of the new season on Saturday 31st March. The Thornton Trophy, a ladies pairs event, was won by Stranraer pair Susan Prentice and Evelyn McLellan with an excellent score of 88-16.4=71.6. In second place were Newton Stewart pair Helena Fox and Lynn Allan with an 87-13.2=73.8 and in third, were home pairing Joyce Maitland and Morag McLean with a score of 104-29.2=74.8. Click the relevant links to the Masters Scoreboard for gents' or ladies' scores.